Welcome to Chevrolet of Naperville, your number one destination for all things related to the famous bowtie brand. Located directly off of Ogden Avenue in Naperville, IL, Chevrolet of Naperville is perfectly situated to assist you in all of your pre-owned car buying needs. As a part of the reputable Dan Wolf Automotive Group, Chevrolet of Naperville is committed to the same standard of excellence that is responsible for the longevity of every successful dealership under the respected name. Whether you are searching for quality pre-owned cars, SUVs, or are in the market for great used trucks for sale, Chevrolet of Naperville has you covered. Here at Chevrolet of Naperville, we have access to a great tool that other area dealerships can’t offer. The Naperville Auto Test Track was constructed by the City of Naperville to be utilized by partner dealerships in the area. Chevrolet of Naperville is a proud partner of this one of a kind car testing facility, and is the only Chevrolet dealership that has access to its many benefits. Situated on nine acres, the Naperville Auto Test Track was designed with the specific intent of allowing car buyers the opportunity to take their potential new vehicles through various terrain at varying speeds in a safely controlled environment. Long stretches of flat pavement allow drivers to see just how accurate those zero to sixty mile per hour estimates are, while cobblestone paths and steep hills provide buyers with a great way to test out capability and safety features. Here at Chevrolet of Naperville, every customer that we take out on a test drive will have the opportunity to spend time on the Naperville Auto Test Track. Rather than spending your free time fighting Chicago traffic during a test drive with another local dealership, you can experience the true nature of your potential new car by taking a test drive with Chevrolet of Naperville. When we made the decision to become an official partner of the Naperville Auto Test Track, Chevrolet of Naperville chose to provide our customers with this unique test driving experience that other dealerships did not. As a dealership that is committed to providing our customers with unparalleled opportunity within their new and used car buying journey, we saw this partnership between ourselves and the City of Naperville as just another way we are able to fulfill that promise. As a Chevrolet dealership here in Naperville, we offer a large inventory of quality used pickup trucks that are capable of providing you with years of lasting durability. The bowtie brand has a long history in engineering and manufacturing reliable pickup trucks, ranging from the midsize Colorado, to the full-sized Silverado. Whether you need your pre-owned pickup to haul, tow, and conquer all terrain, or are in the market for a pickup that simply fits your personality, the Chevrolet brand has what you need, and they can be found right here at Chevrolet of Naperville. One of our favorite pickups from the Chevy brand is the midsize Colorado. After taking a hiatus from sales here in the United States, Chevrolet brought back the small pickup for a BIG comeback. The Chevy Colorado earned the highly coveted Truck of the Year award from Motor Trend Magazine for both the 2015 and 2016 model years, making it quite literally the best pickup truck in America. Both of these model years are currently available to purchase pre-owned, making it an exceptional time to buy this very impressive midsize pickup. For drivers in the market for a bigger truck with enhanced capabilities, the Chevy Silverado offers incredible performance at unbeatable prices. 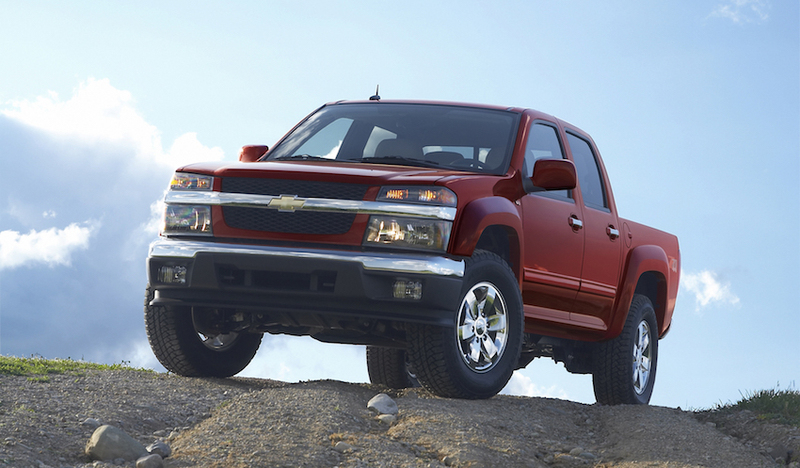 The Silverado is America’s most trusted pickup truck, and has been on the market in one form or another since 1999. With plenty of high quality pre-owned options to choose from, drivers in this segment can get a lot of amenities, power, and performance for much less, by purchasing a used Silverado from Chevrolet. Just like its younger sibling, the Silverado has also earned the coveted title of Truck of the Year by Motor Trend Magazine numerous times. The Chevy Silverado was the first full-size pickup to offer 4G LTE Wi-Fi connectivity for its passengers, an in-vehicle innovation that thousands of drivers are now able to take advantage of wherever the road takes them. Both the Chevy Colorado and Chevrolet Silverado have been awarded for their quality, dependability, and performance, which makes them incredible pre-owned vehicles to check out. Chevrolet of Naperville has quality pre-owned models of both the Colorado and Silverado in stock, and ready for you to take for a test drive. If you want a long-lasting, dependable pickup without having to pay the full MSRP on a brand new model, consider coming down to Chevrolet of Naperville to experience all of the benefits purchasing a pre-owned Chevy truck offers. At Chevrolet of Naperville, our knowledgeable and friendly sales team will walk you through the entire car buying journey. From helping you select the perfect vehicle for your lifestyle, to working with you throughout the financing process, our team is dedicated to providing you with an exceptional used car buying experience. The newer Chevrolet pickup trucks are loaded with the most advanced in-vehicle technology, and we know that it can be daunting to have to try and figure out how it all works. For that reason, Chevrolet of Naperville is equipped with a state of the art Connectivity Center that allows us to walk you through each technological feature your vehicle is equipped with, so you can drive away feeling confident and well-prepared for the road ahead. When you purchase a pre-owned car, truck, or SUV from Chevrolet of Naperville, you are guaranteed to have an exceptional buying experience, and support for the entire time you own your vehicle. Our exclusive Pit Pass benefit program is included in your used car purchase, and allows you to stop by anytime during regular business hours to have your vehicle checked over for any possible problems. Our expert technicians will quickly and accurately check for any low fluid levels, top them off as needed, and even ensure that your tires are properly inflated – all for free. As a used car dealership here in Naperville, we aren’t required to offer this exclusive program, but we feel that it is just another way that allows us to better serve our customers in every way that we can. Whether you are on the market for a reliable pre-owned Chevy pickup, or are interested in a used version of another model in the bowtie brand’s lineup, Chevrolet of Naperville has you covered. We even offer pre-owned options from other major automotive brands, such as Ford, Honda, and Hyundai. If a quality vehicle at an affordable price is important to you in your used car search, then look no further than Chevrolet of Naperville. Come down to 1515 W. Ogden Avenue right here in the heart of Naperville, and take one of our incredible pre-owned cars for a test drive, today. We are located just minutes from I-88, so it doesn’t matter if you live directly in downtown Chicago or in the far southwest suburbs, Chevrolet of Naperville is easily accessible for your ultimate convenience. We hope to see you soon!